This year for science, Sunshine has been learning about Sound, and Fluid Dynamics through CrossWired Science. Science is one of those topics I find a bit hard to teach at home, so I was excited to review this new website. CrossWired Science offers engaging, fun content about a variety of science topics from a Christian perspective. The CrossWired Science website is easy to navigate. Students login and go to Curriculum. They then choose the topic they’re currently working on (right now, that’s either Sound, or Fluid Dynamics, but more topics are coming soon!). On the next page, students choose which lesson to work on. Completed lessons are marked with a check in the corner. Each lesson has a brief video (under 5 minutes), PDF worksheet, and a quiz. Once students have watched the video, completed the worksheet, and taken the quiz, they can click on “complete” to move on to the next lesson. Students can watch the videos as many times as they want, but they can only complete the quiz once. The videos combine animation with live video of two instructors for a fun, engaging lesson. Each video moves quickly yet covers a lot of topics. For example, the first Fluid Dynamics video explained to students what fluid dynamics is, introduced scientist Bernoulli and his contributions to the discipline, and showed some ways fluid dynamics is used (such as blood pressure). Each unit includes experiments to help students apply what they’ve learned. 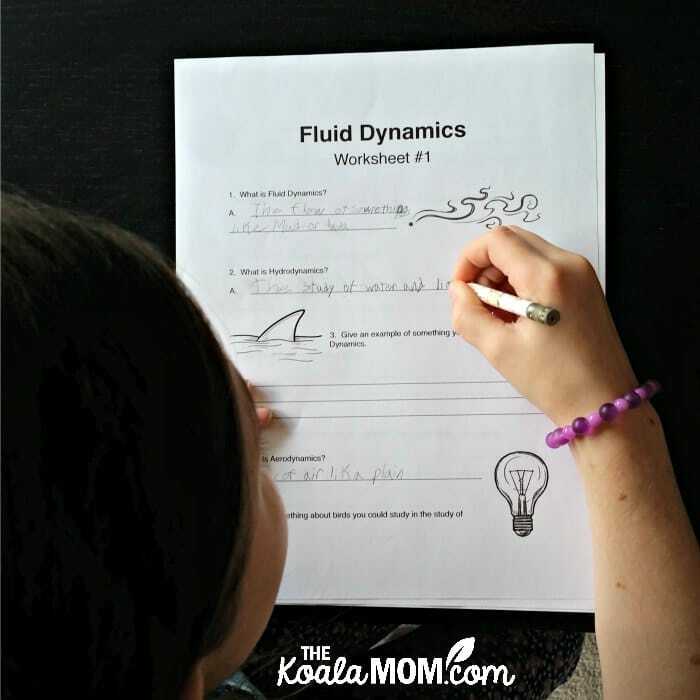 For example, after completing the first four videos on Fluid Dynamics, students can explore a list of related experiments. These include folding a paper airplane, dissecting a shark, or making a model feather. Most of these experiments can be printed as a PDF. I found these busy—each was crammed with instructions, bright highlighting, and tons of links that left Sunshine a bit overwhelmed. The units also offer further ideas for learning application. For example, under reinforcement, you’ll find more ideas for projects related to the topic, including colouring or drama pages, drama snapshots, multi-media projects, posters, puppets, etc. If your student is super interested in the topic, there are tons of ways here to explore it more. Or if your student is less interested, there are lots of ideas here to help them engage. For example, a student who dislikes science may still be interested in a historical person like Bernoulli, and could do a character study or write a drama about him. One reason I like CrossWired Science is that its geared for multiple ages. There are no grade levels in the curriculum. Teachers or parents can look over the material to decide what’s appropriate for their students. You can assign separate logins for each student, so that they can check off videos they’ve completed and (if applicable) type in their own answers to complete each section. Sunshine (grade 5) was able to work through the lessons on her own, choosing her own experiments and printing the pages she needed. If she was frustrated, I could help her find more information or clarify a question. The core videos in each topic are meant to teach elementary students through high school students. Some of the material in the videos may be over a younger student’s head or a bit basic for an older student. That’s okay! It will challenge younger students and cement basic information for older students. Advanced students will probably still find info they don’t know in the core videos and plenty of challenging information in the Links, the Digging Deepers and the Gold Digs–as well as in all the other lessons. Stand-alone Curriculum or Science Supplement? CrossWired Science can serve as a stand-alone science curriculum for students in grades 1 through 12. Older students will be able to work more independently and do more of the accompany activities, while younger students will need more help and do less. CrossWired Science has a handy calendar under Teacher Resources. You can follow their calendar to cover the materials, or use the calendar to create your own study plan for your students. 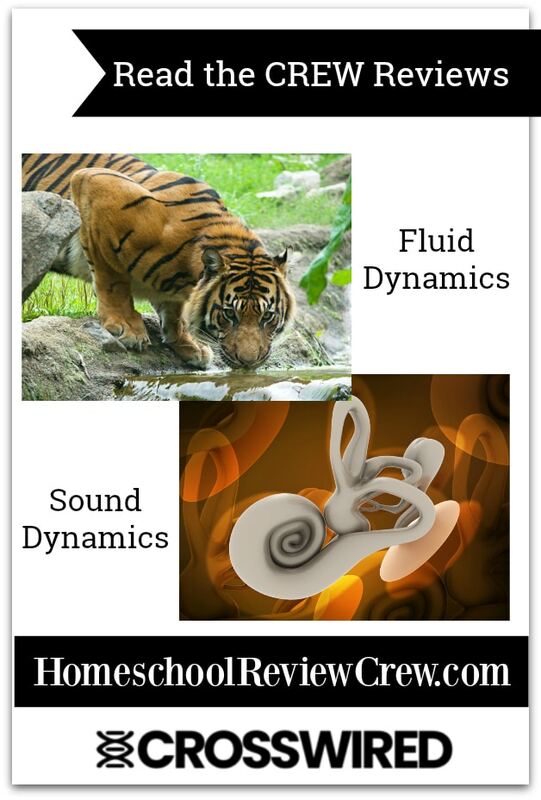 More material will be coming to the website soon (likely before you finish studying Sound, and Fluid Dynamics!). You could also use CrossWired Science to supplement another science curriculum. For example, we read about Sound in the girls’ science textbook and then viewed the videos. I like going to a trusted website such as CrossWired Science for extra materials, instead of trying to wade through all the internet resources myself and choose the best videos or websites. I also liked the way all the printables provided a paper record of student’s learning. We created a science binder for Sunshine with her worksheets and experiment pages. This makes it easy to see what she’s learned through the year and to show her science projects to a homeschool teacher at the end of the year. CrossWired Science does have a Christian perspective on science. I appreciated this, because so many science textbooks and curriculum are written from a secular, evolutionary viewpoint. The website creators acknowledge that science points us to God and that we can celebrate the glory of creation while studying it. If those resonate with you, I’d encourage you to check out the “Ed Whys” for more about each topic. It’s easy to see that Don and his team are passionate about science, faith and learning, and they bring that passion to CrossWired Science. Check out the CREW reviews to see what other homeschoolers have thought about CrossWired Science and how they have used it in their homeschool. To find out more about CrossWired Science and sign up for your own subscription, visit their website. Check out the Sample Unit with your student to see how they like the materials. Use code koala13 to get $5 off your subscription!